Be the first to share your favorite memory, photo or story of Pablo. This memorial page is dedicated for family, friends and future generations to celebrate the life of their loved one. 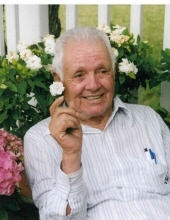 Pablo Barba, born January 15, 1926 passed from this life on February 5, 2019 at the age of 93. He is preceded in death by his grandchildren Juan Pablo Barba, and Victoriano Barba, and Tanya. Pablo Barba is survived by his sons, Pablo Barba, and Odilon Barba; daughters, Gloria, Anita, Rita, Maria, Agustina; brothers Fortino, and Elpidio; sisters, Silvina, Adela, and Chelo; 36 grandchildren, 71 great grandchildren with 2 on the way; and 1 great great grandchild. Pablo was a loving husband, father, and grandfather, he absolutely adored his wife. His grandchildren meant the world to him, he completely spoiled them at every chance he got. Pablo loved to cook, and was a magnificent gardener. He will be missed dearly. To send flowers or a remembrance gift to the family of Pablo Barba, please visit our Tribute Store. "Email Address" would like to share the life celebration of Pablo Barba. Click on the "link" to go to share a favorite memory or leave a condolence message for the family.